Two public performances are scheduled for the 21st Snowy Range Summer Dance Festival at the University of Wyoming. Festival students will share dances they have learned at their schools or studios during the free Student Showcase concert Tuesday, July 19, at 7 p.m. in the UW College of Arts and Sciences auditorium. The final Gala concert will be performed Saturday, July 23, at 4 p.m. in the Arts and Sciences auditorium. Tickets cost $12 for the public and $10 for students and senior citizens. For tickets and information, call (307) 766-6666, go online at www.uwyo.edu/finearts, or visit the Buchanan Center for the Performing Arts box office or the Wyoming Union information desk. The festival runs through Saturday, July 23, with participants taking daily classes in ballet, modern and jazz, with optional classes in tap, pointe, choreography and improvisation. The Snowy Range Summer Dance Festival features a faculty of world-renowned teachers and performers who present a unique collaborative artistic experiment. The faculty work on developing new choreography for the Gala concert, set repertory on the student dancers, and teach technique and specialty classes. 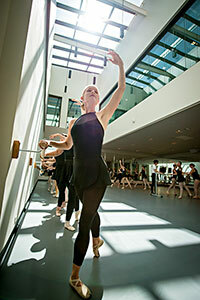 The program provides professional-level training and performance for dancers ages 13 through adult. Festival faculty members are Shayla Bott, Brigham Young University assistant professor; Monica Campbell, artistic director of Utah Valley University’s contemporary dance ensemble; Northwest Dance Project member Samantha Campbell, from Salt Lake City, Utah; Jarek Cemerek, international contemporary dance teacher and choreographer from the Czech Republic; Caroline Fermin, teaching artist at New York City Center; Thayne Jasperson, Broadway smash “Hamilton” cast member; André Megerdichian, co-artistic director of the New York-based Resonance Collective; Limón Dance Company member Francisco Ruvalcaba; dancer Tian Tian, from Beijing, China; Edel Quin, of the Trinity Laban Conservatoire of Music and Dance in London, England; and Maurice Watson, dancer and teacher from Long Beach, Calif.
UW Department of Theatre and Dance faculty members are festival directors and instructors: Associate Professor Jennifer Deckert; Marsha Knight, professor; Margaret Wilson, professor; and Aaron Wood, assistant lecturer. Festival participants are experiencing the new facilities in the Performing Arts Center, including the studio and a dance science room. The new dance studio has enhanced audiovisual capabilities, and the Mains dance studio has drapery and lighting installed so it also can function as a performance space.